A small team departed for Russia on October 24th, in order to lead an EEMN Friendship English Language School at the Lutheran Church in Kondopoga. The 2016 Russin Yarovaya Law has significantly restricted the way churches and foreign missionaries may function in the Russian Federation. However, the law does not forbid our activity, nor quench the thirst people have for the Gospel of Jesus Christ. 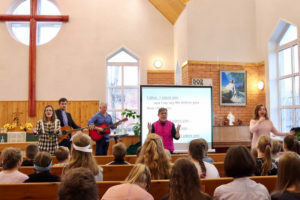 While the days of leading large camps in Russian public schools appear to be gone, we are still able to host smaller camps in local church buildings. We were blessed to host 30-40 students during the week long event. And the following week, the team taught English, also spending time volunteering at a local orphanage and a day school for children with developmental challenges. The 2018 Kondopoga Friendship English Language Club was a blessed and resounding success, with 42 students, aged 7-17! The only challenge was that the week went by way too fast. 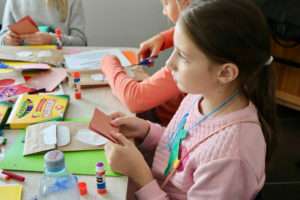 Together, we practiced speaking and learned more English through exploring the biblical story of Joseph. There were three classes led by Suzie, Mike, and Angela, and team leader, Debra led the opening and closing group sessions and crafts. Of course, none of this could have happened without our incredible hosts and co-leaders Tatiana, Pr. Vadim, Oksana, and so many others who volunteered from the Kondopoga Lutheran Congregation. Everybody enjoyed the games, singing songs, and preparing and performing the dramas that each class shared during the closing ceremony, on Friday afternoon. Above all, great connections and genuine friendships were formed to the glory of God! Russians are known for being consummate hosts and they treated the EEMN team like royalty, including dressing them in traditional royal costumes during an evening hosted by the Kondopoga Ladies English Club! The EEMN team has also been invited to visit and teach English at the local schools and also spend time serving orphans and children with developmental challenges. Thank you for your continued prayers and support! *Originally published on EEMN.org. To learn more about this specific trip or the ministry of EEMN, please visit: East European Missions Network.